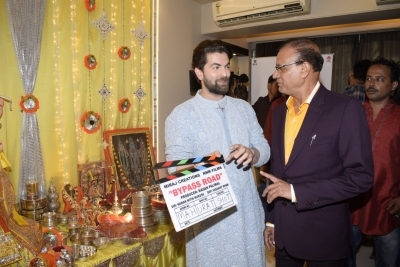 Mumbai Sep 14 (IANS) Actor Neil Nitin Mukesh will be seen in the upcoming film "Bypass Road" which marks the directorial debut of his younger brother Naman Nitin Mukesh. The film also stars Adah Sharma Gul Panag and Rajit Kapur. On the occasion of Ganesh Chaturthi on Thursday Naman tweeted: "On the auspicious occasion of Ganesh Chaturthi we set you on a riveting journey ahead. Presenting Miraj group Production s in association with Nnm Films. Starring Neil Nitin Mukesh Adah Sharma Gul Panag Rajit kapur. Bypass Road ." Neil currently has films that are in various stages of pre-production. These include Saaho" "Firrkie" and "Ikaa". NNM Films and Madan Paliwal of MIRAJ will jointly produce the thriller drama. Its mahurat shot will be inaugurated at Mukesh s 25th Ganesh Chaturthi celebrations and thereafter the film will be shot in Alibaug and Lonavala over a span of three months.